The European gas market’s ability to absorb surplus global LNG flows may be tested over the next five years. China’s appetite for the more than 150 bcma of new LNG supply will be a key factor impacting the European gas market balance over this period. The European gas market’s ability to absorb surplus global LNG flows may be tested over the next five years. More than 150 bcma of new LNG supply is under construction for completion by the end of this decade. Surplus LNG supply above Asian and emerging market requirements will primarily flow to Europe. European hubs should be able to absorb additional LNG flows in an orderly fashion as long as European suppliers retain the flexibility to reduce pipeline contract volumes. But once swing flexibility above contract ‘take or pay’ levels is exhausted, European hubs may reach a tipping point, as we set out in a recent article. Beyond this tipping point, hub prices may fall sharply and disconnect from oil-indexed contract prices, as was the case in 2008-09. The interaction between Chinese and European demand growth will play a key role in determining whether this tipping point is reached. 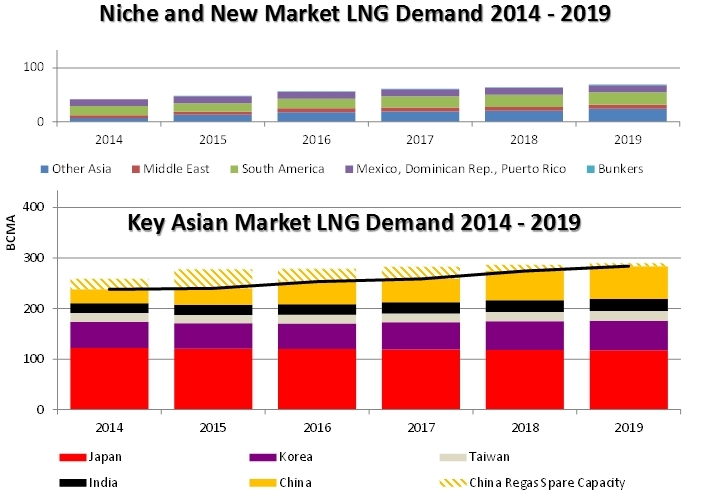 Anticipated growth in Chinese gas demand has underpinned much of the 150+ bcma of new LNG liquefaction capacity under construction. The fundamental logic behind this is robust. China has made clear its intentions to orchestrate a centrally planned shift away from coal towards gas for power generation, in order to address local pollution issues. But Chinese gas demand and Chinese LNG demand are two different things. China signed 68 bcma of framework agreements for oil-indexed pipeline imports from Russia in 2014. Although the terms of these agreements are far from concluded, they reflect China’s intent to ensure gas supply diversification. This is in addition to anticipated growth in existing pipeline imports from Turkmenistan and Central Asia via the West – East Pipeline. China has also made clear it wants to develop its own unconventional gas production as a third pillar of supply (although this is unlikely to start to have a significant impact until next decade). Chart 1 shows the relative importance of Chinese LNG demand in a global market context. It assumes an 18% compound annual growth rate for Chinese LNG demand which means current Chinese regas capacity is broadly fully utilised by the end of the decade. This would be broadly in line with presentations from CNPC of November 2014. The volume of Chinese LNG demand will be price sensitive. If the current conditions of lower LNG prices continue, China may provide key LNG spot price support as an opportunistic buyer of surplus LNG. We looked at factors driving Chinese LNG demand here. But why is Chinese LNG demand so important for Europe? In an oversupplied global gas market, the majority of surplus LNG that is not bought by China (and to a lesser extent other opportunistic buyers) will flow into European hubs. Europe plays a key price support role in an oversupplied global LNG market as we explained here. The volume of European gas demand growth over the remainder of this decade will be a key determinant of Europe’s ability to absorb LNG flows in an orderly fashion. Chart 2 shows the European gas market balance assuming recovery from 2014’s weather related demand levels and a 1.5% pa growth thereafter, based on a combination of economic recovery and nuclear and coal retirement substitution. . The chart has been developed based on the global LNG demand projections shown in Chart 1. In other words LNG supply over and above aggregate LNG demand shown in Chart 1 is assumed to flow into Europe (the turquoise shaded area in Chart 2). The chart illustrates LNG flows displacing flexible Russian pipeline contract volumes. Chart 2 shows a finely balanced European gas market. Virtually all of the flexibility to ramp down pipeline contract volumes to the traditional 85% take or pay levels is utilised to allow the European market to absorb LNG flows. It is important to note that there is likely to be some additional flexibility to ramp pipeline volume take below 85% ToP levels as we set out here. But Chart 2 suggests that a slower pace of European demand growth, for example induced by continued economic stagnation or a new recession, may be enough to upset the European gas market balance. If instead of the recovery described above (and shown in Chart 2), European demand in 2019 was only 8% above that of 2014, this would be enough to push the European market beyond the tipping point. Questioning the robustness of Chinese LNG demand was a somewhat controversial view in early 2014. But the industry consensus on Chinese LNG demand growth volumes has been shaken by over the last twelve months. This in conjunction with 150 bcma of new supply (predominantly from Australia and the US), has focussed attention on the ability of China doing the ‘heavy lifting’ to absorb new supply, via its growing fleet of regas terminals. Even at the lower spot LNG prices of the last year, this is not a foregone conclusion given the reduction in China’s industrial growth rate. Europe has in the past been the receiving market for LNG supplies surplus to Asia’s requirements. This was demonstrated in 2010 when weather induced high demand allowed volumes to be absorbed with albeit minor difficulty in meeting Russian pipeline contract take or pay commitments. 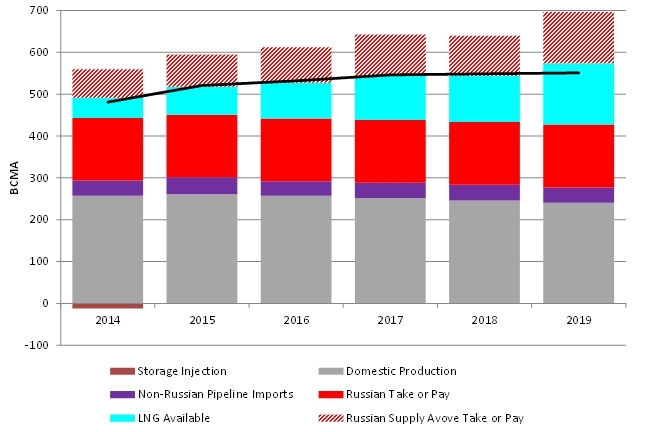 Between 2015 and 2019 the path of European demand will be key in determining this market’s ability to absorb large new LNG volumes while meeting Russian contract take or pay levels. Events will of course be subject to uncertainties of economic performance and power sector fuel mix in addition to weather. But if Europe cannot absorb surplus LNG, the tipping point phenomenon we have described will become evident in hub price falls and a significant pick up in prompt price volatility.